The first time they saw daylight was when I rescued them! A year has passed and still the stealing goes on! To-day was a good example of this. First a little reminder of where we were a year ago when I began to tell their story. The first time they ever saw daylight was when I rescued them. It was a late summer evening when a hundred cladly dressed Hippy Chicks filled my beaten up old car. I'm sure they didn't mind, as they were due to be slaughtered. 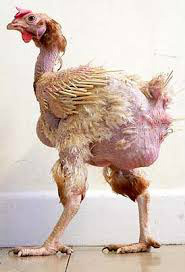 Meanwhile, a friend of mine had just received a delivery of superb looking hens from the Cotswolds. There was no comparison. They were indeed Posh Chicks with every feather intact. Well time has moved on and I'm delighted to say that all of the hens survived their ordeal and apart from the twenty hens I kept, the rest were re-homed and happy. That's more than I can say about the Posh Chicks down the road. Sadly, the Time Stealers are always about and they come in many different guises. This time the guise was a fox. You see, timing is very important if you don’t want to lose anything and Posh Chicks were let out too early. It was still dark when the fox attacked....and the rest is history! Meanwhile, the Hippy Chicks have survived the outdoor life and now have an abundance of feathers. We also have some Posh Chicks these days, but you can hardly tell the difference. They do have a story to tell however, check it out on SMALL TALES page!